China, Ching Dynasty. Shun Chih, AD 1644 to 1661. 1 Cash. S-1405. 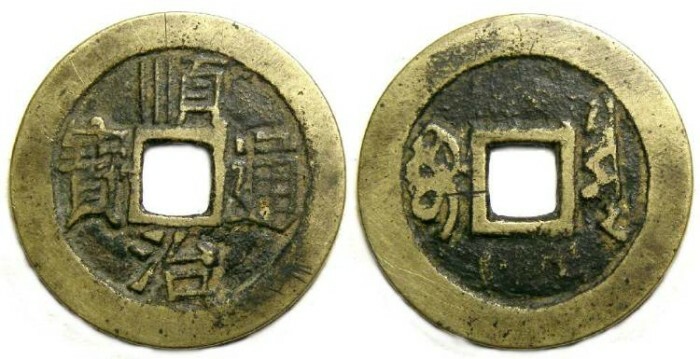 Shun Chih is normally listed as the founder of the Ching Dynasty, but it was actually his grandfather that founded the dynasty, and father who issued the first Ching coins. Shun Chih is just the ruler to increased the territory they controlled to a point where it could be said the Ching controlled most of China. Emperor : Shih Tsu using the title Shun Chih. Date : AD 1644 to 1664. Denomination : Bronze cash. Mint : Board of Revenue. Size : 27.7 mm. Weight : 4.94 grams.